With the European skiing and snowboarding in full swing, we’re seeing a lot more patients with injuries sustained on the slopes coming through the doors of the clinic. Skiing and snowboarding does have a reputation of being a risky sport, but the overall injury rate for skiers is a little lower than it is for snowboarders, who have a higher injury risk rate. In general skiers tend to sustain injuries to the knee due to the twisting motion and the ski boot fixing the position of the ankle in place, leading to greater force transference than usual at the knee. Around 45% of skiing injuries occur to the knee joint. The anterior cruciate ligament (found in the middle of the knee) is prone to rupture, when skiers weight continues forward during a fall. Rotation injuries can, as with borders not only injure the medial collateral ligament (a band of tissue on the inside of the knee) but sometimes also affect the cartilage inside the knee, otherwise known as the meniscus. Snowboarders are more vulnerable to injuries of the shoulders, wrists and ankles. With 40% of injuries occurring to the wrist due to falls and the repetitive action of pushing up from the floor, which can cause over-strain of the ligaments at the palmar side of the wrist. This can lead to localised swelling and discomfort. 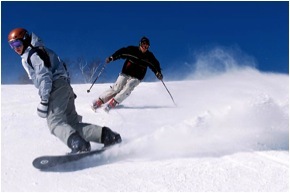 Skiing or snowboarding over rough terrain can alter the forces experienced through the lower back. If a turn isn’t quite successful it is possible to cause a jarring force into the lower back that can cause localised swelling between the small joints in the spine. This can cause an initial sharp pinching sensation that can later result in stiff and sore back. Most injuries for both skiers and snowboarders occur either by falling down or loss of control during a jump, with a very small amount occurring by collision with other skiers or riders. This demonstrates the fact that the skiers or riders themselves’ are at fault. Poor fitness, poor selection of terrain or conditions, poor judgement of one’s ability, or poor maintenance of equipment are factors in many injuries. The key message here is that many skiing and snowboarding injuries are preventable. Fortunately, most snow sport injuries are minor and should be treated immediately with R.I.C.E (rest, ice, compression and elevation). If you’re planning a skiing or snowboarding holiday in the next couple of weeks, now is the time to think about how best to avoid any of these injuries. The most important thing in all this though is to enjoy your holiday and put yourself in the best stead to come back home with nothing more than good memories. If you do experience any injuries on the slopes, remember R.I.C.E and give us a call on your return further assistance.